This recipe was shared by Wink and from comments of those who have tried it, it seems like this is a good recipe to try. So tonight on my way home from work, I dropped by NTUC to get a tub of plain yoghurt to try it out. I would say the texture is really soft and moist. 2 Sieve flour, bicarbonate soda and cocoa powder together. Stir in sugar. 3. Beat egg and vanilla essence together, add in all the wet ingredients to into flour mixture. Add in the chocolate chips before you mix the batter. 4. Fold together until the flour is dampened, but not smooth. 5. Spoon mixture evenly into lined or greased muffin tray. 6. Bake for 20 mins or until the until skewer comes out clean. 1 cup = 250ml, right ? And 1-cup-measurement of liquid (e.g. milk, yoghurt) is the same 250ml as for solid form (e.g. powder/sugar)? Looking forward to you reply. My boys love this when I showed them the picture. Going to try this soon. 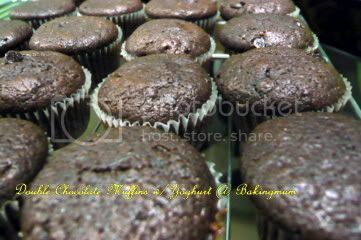 The muffins r nice, i got good comments for it...Thanks. Thanks for ur receipe. Printed out and let dd bake it and her friends like it very much...but our color seem to be lighter! Ya very simple that even children can try this recipe. Maybe it is the different type of cocoa powder used. 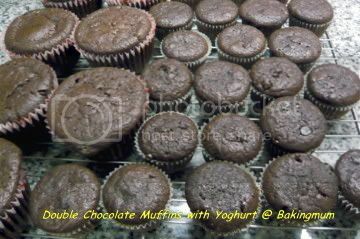 sorry.. need to bother u.. but my muffin will stick to the paper cup.. what's the reason behind it? Jj, your cake stuck even after the cake has completely cool down? That is strange and I really don't know why.